Wednesday’s game was not good. CC Sabathia fell apart after four innings, Chasen Shreve came in with a three-run lead and allowed two hits to start the bottom of the sixth for the Rangers. 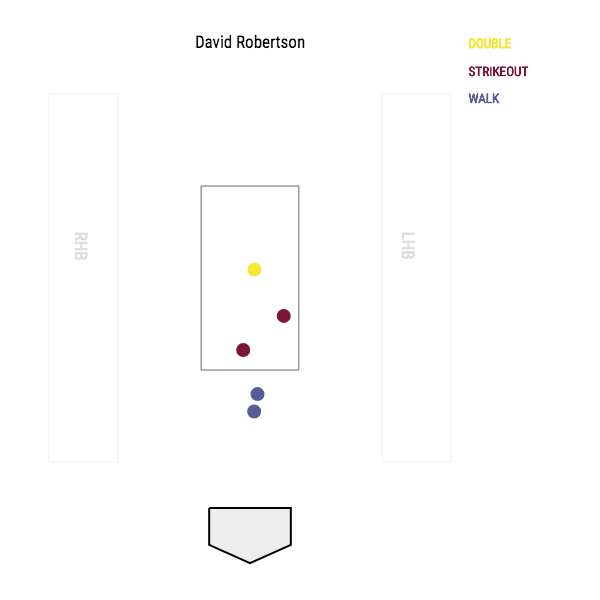 Then David Robertson walked two more, which let in a run and then gave up a bases-clearing, go-ahead double. What’s worse is that the Yankees had a 4-0 lead and a 10-5 lead erased by a combo of bad pitching and not-so-stellar defense. The good thing is, they’re off today. Maybe they’ll watch some film of Wednesday’s game so they can see what no to do this weekend against the Angels. 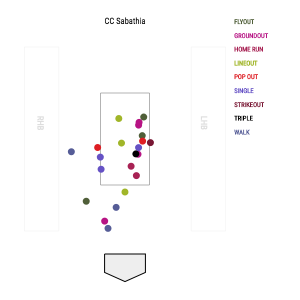 We’re going to look at all the pitches Sabathia, Shreve, and Robertson made that yielded a result (single, double, walk, strikeout, etc.) and see where the pitches landed. Spoiler: Most of the pitches that resulted in a positive outcome for the Rangers, got too much of the plate. 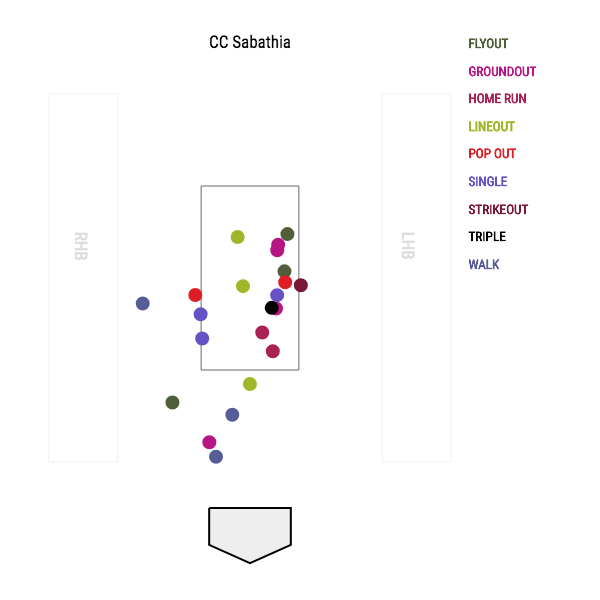 Without further adieu, here are all of CC’s pitches which resulted in an outcome (single, double, strikeout, walk, etc. ), We’re not going to look at every single one of his pitches. The two home runs he surrendered in the fourth inning were off his slider. It didn’t dive enough in either at-bat and both Jurrickson Profar and Ronald Guzman took advantage of the lack of movement. Both of the pitches were in the zone and a shade below 80 mph. Essentially, they were meatballs and CC served them up on a platter. 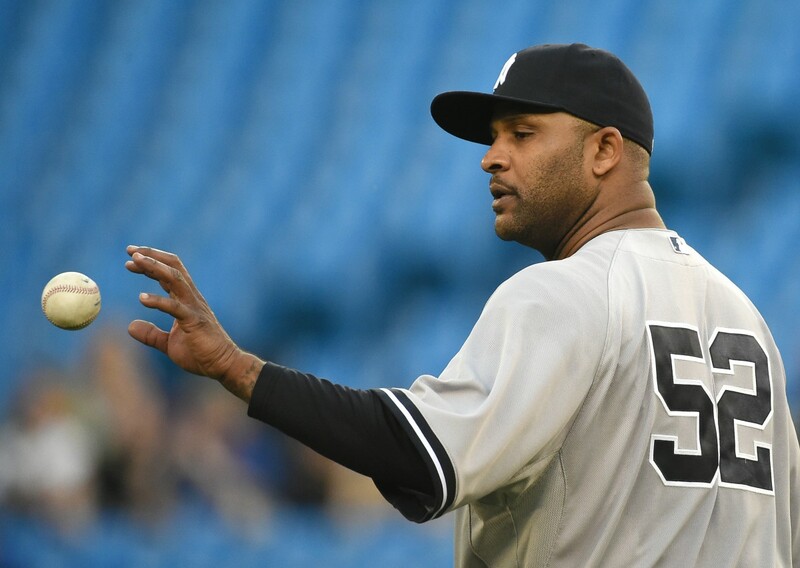 Sabathia left the game after giving up two more runs in the bottom of the fifth and the Yankees had a 10-7 lead. Jonathan Holder did what he needed to do: Hold the lead at three and get the Yankees out of the inning before Texas had a chance to tie the game. 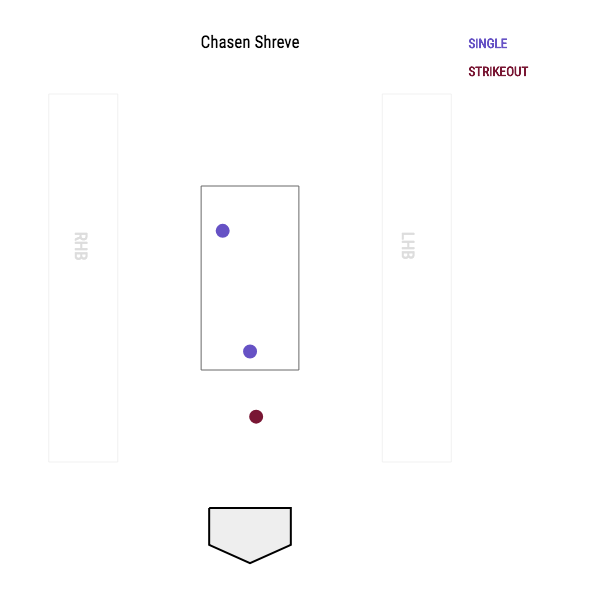 Chasen Shreve who came in and gave up a single to Guzman struck out Carlos Perez and gave up a single to Delinoo DeShields. He was taken out and replaced by David Robertson who gave up a walk to Shin-Soo Choo to load the bases and gave up another walk to Isiah Kiner-Falefa to score a run and make it, 10-8. 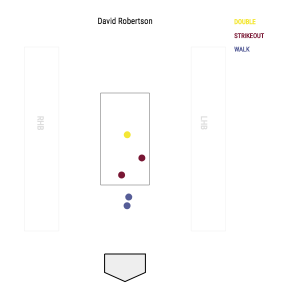 Robertson was able to strike out Nomar Mazara to get the second out of the inning and then his first pitch to Profar was right in the zone and Profar hit it to right center field to split the outfielders and clear the bases. The Yankees were now down 11-10. The Rangers would score an insurance run in the bottom of the eighth off Dellin Betances who had a clean bottom of the seventh but then forgot how to throw the ball the following inning. He screwed up a pickoff attempt on DeShields and the Rangers were able to get another run across when DeShields scored from third (after he stole it, of course) on a Kiner-Falef single. Here are Chasen Shreve’s outcomes. Now, to be fair to Shreve, he did make a good pitch the strikeout; it was a splitter. But the two pitches that yielded singles were too much in the zone. He threw a 90.1 mph fastball to Guzman and an 83.6 mph splitter to DeShields. And here are Robertson’s outcomes. It’s just frustrating and disappointing to watch the Yankees score 10 runs and lose. It shouldn’t happen. This loss resulted in a series loss for the first time in nine tries so the Yankees are still playing well, but, you can lose to a team like Texas. They’re not good. We have a little while until the trade deadline but Brian Cashman better look for at least two pitchers. There’s an old baseball adage “You win championships with pitching and defense”. Attn: NYY. Take action now.